Citation Information: J Clin Invest. 2010;120(7):2619-2626. https://doi.org/10.1172/JCI42297. Y-27632 stabilizes the growth rate of primary keratinocytes. 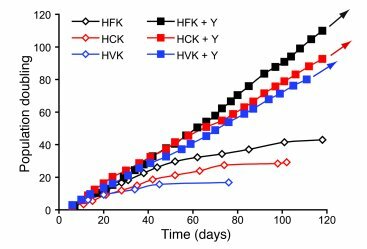 Growth rate of human keratinocytes from foreskin (HFK strain c; black), ectocervix (HCK; red), and vaginal tissue (HVK; blue) cultured in the presence (filled squares) or absence (open diamonds) of 10 μM Y-27634 (Y). The arrows indicate cells lines that continued to divide indefinitely. The growth rate is measured as population doubling per day.